Risk is to projects what gravity is to the world around us. Risk is inherent in the process of managing projects, whether we choose to recognize it or not. And like gravity, risk can be both beneficial and detrimental to our projects. A skier uses gravity to propel himself down the slope, understanding that the same force necessary for this propulsion can also cause great harm to the body and confidence when a sudden and unexpected fall occurs. Like the skier, project managers must understand that risk exists, and can have both good and bad consequences on any projects. The process of identifying and planning for risk does not have to be cumbersome, formal, or mundane. In fact, an ingenious project manager will use an exercise like risk identification to glean other, secondary benefits for their project team. For example, the process of conducting a risk identification session using a round table approach can create the foundation for cohesion amongst the members of a project team. As ideas and suggestions are solicited from project contributors, they have a heightened sense of making a substantive contribution to the project at hand. In order to protect their investment in a project, an organization only needs to consider a practical approach to planning, identifying and analyzing potential risks in order to put a reasonable and viable risk management plan in place. 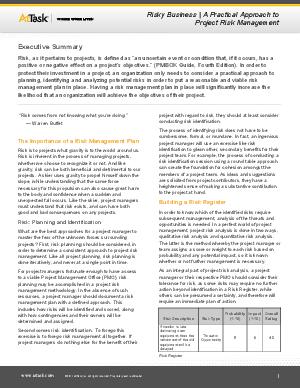 Having a risk management plan in place will significantly increase the likelihood that an organization will achieve the objectives of their project.